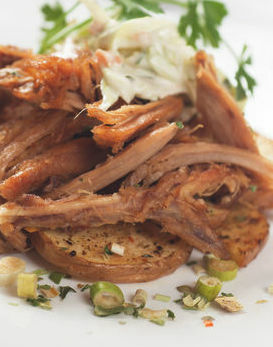 This Mouth-Watering Slow Cooker Pulled Pork Recipe Never Fails Me! It’s So Great For Tailgates! It’s so nice to find a recipe that blows people away every time and that you know you can count on to make a great impact with very little effort. This slow cooker pulled pork recipe is one of our absolute favorites and you’ll understand why once you make it! First, there’s the ridiculously good flavor that we dream about, for which we get constant requests to create. Then there’s the fact that all you have to do to prepare it is cut up a few veggies and rub it down in a simple spice mixture, before putting it in the cooker. Easy peasy! Whether you’re having an outdoor BBQ or a regular family dinner, this dish takes the cake every time and you barely have to lift a finger! Combine paprika, chili powder, salt, pepper, cumin and cinnamon in a medium bowl and mix together. Add honey, apple cider vinegar and olive oil and stir to make a thick paste. Rub spice paste all over pork shoulder. Place onions and garlic at the bottom of slow cooker, then place pork on top. Pour remaining spice mixture over the pork and pour in chicken broth. Turn cooker on LOW and cook for 6-8 hours, or until pork is cooked through, but still tender enough to be shredded with a fork. Shred and serve along or with your favorite barbecue sauce and/or potatoes and coleslaw.